Saint Blaise is the patron saint of Montfort-Sur-Argens, as well as Dubrovnik, Pézenas, and over 120 Italian communes. One of the Middle Ages’ most popular saints, Saint Blaise’s cult developed during the 11th and 12th centuries AD. Saint Balise was believed to cure illness. The Relics of St. Blaise rest in the Saint-Eucaire Church at Metz. 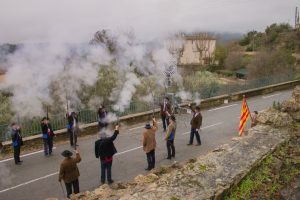 I had the privilege of observing the yearly ‘Fête de Saint Blaise’ celebration in Montfort sur Argens last weekend. 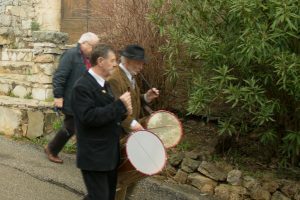 As the Village’s patron Saint, Saint Blaise is honoured with a unique traditional celebration on the first weekend of February, with a church service, procession, music and ‘Bravade’. The building in the background is Maison Lambot B&B. The church service is held on the Sunday morning. 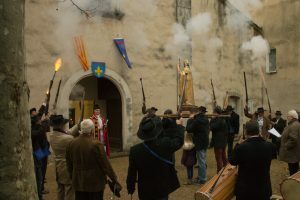 The congregation form a procession as they leave mass, following the costumed, musket-firing ‘Bravadeurs’ of Montfort-sur-Argens, and the drumming ‘Tambourinaires’ of Saint Sumian, with four people carrying the statue of Saint Blaise aloft on a platform. The congregation follow, singing Hymns to the Saint. 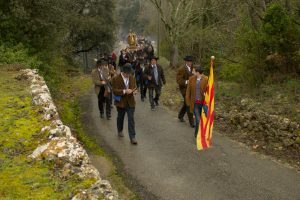 This dramatic procession winds its way through the narrow streets up to the castle, with frequent halts for prayers, and for the Bravadeurs to fire off et another thundering salvo with their black powder guns. 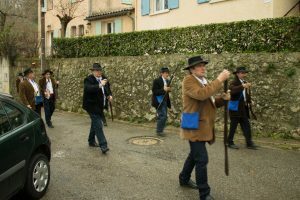 The parade is followed by a lunch in the village hall, and a pétanque (bowls) competition in the afternoon. 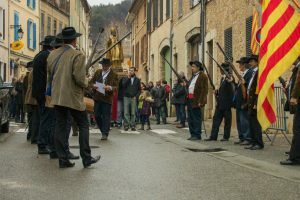 The rousing drumming, traditional costumes and songs, mixed with the smell of gunpowder lingering in the air give this celebration an authentic and immersive feeling. Combined with the backdrop of the medieval village, you truly feel that you are stepping back in time. Montfort-sur-Argens is a short, beautiful drive off the A8 motorway from Marseille (1 hour) or Nice (1.5 hours) Airports. Aix-les-Milles Eurostar and High Speed Train is under an hour away. 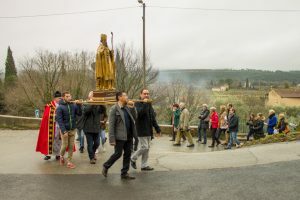 Honouring Saint Blaise, patron saint of Montfort-sur-Argens, outside the church that bears his name.